By now everyone knows that Justice Scalia died recently. Most people also know that he was a bastion of Conservatives on the U.S. Supreme Court. At least, that is how he is usually described (it's actually a bit more complicated than that.) And some people now also know about his unlikely friendship with Justice Ruth Bader-Ginsburg. I'd like to focus on that last fact. But first, a brief word from our sponsor: "The Law". The main issue that comes up whenever Scalia's name is uttered is whether judges should simply strictly apply laws, especially the Constitution, exactly as they are written, or whether judges should modify their interpretations over time as society changes. The former approach is often called Strict Constructionism or Originalism. Legal scholars, who amuse themselves with such things, might disagree that those two concepts amount to the same thing. But they are close enough for rock and roll (or opera)... or in this case, "close enough for "The Law". Which brings us to the latter approach: The Living Constitution is a term used to describe the idea that legal interpretations can, and should, adapt to changing social mores. Judges who believe in this approach are often accused of being judicial activists, who are essentially 'legislating from the Bench'. I don't want to wade into those shark-infested waters (get it? Shark infested?) No, that is just too close to politics for me. I try to be neutral here, or at least as neutral as humanly possible. However, I will say this: for everyone who believes strongly that laws are to be strictly interpreted I merely ask whether you have read those laws, especially the Constitution. There are volumes and volumes and volumes of case law, interpreting various sections of the Constitution. For example, even strict constructionists (an approach that was strongly influenced by two Stanford Lawyer Supreme Court Justices by the way, O'Connor and Rehnquist) agree that we are protected from illegal searches of cars and automobiles and computers and cell phones by the Constitution. The same judges also argue that gay marriage has nothing to do with Constitutional protections since the Framers couldn't possibly have considered that when they wrote the Constitution. So please explain to me how they considered computers and cell phones. I don't get it. Moreover, often the sacred "text" everyone upholds, as being beyond anything other than strict interpretation, is in reality only a few sentences. The Fourth Amendment that is used to protect us from those illegal cell phone searches? It's exactly 54 words long, none of which are "cell phone". Literally millions of words have been written interpreting these few words in every type of court in the country, which seems to exceed the word limit if it is to be so strictly construed. By the way, when this very text was once floated as an amendment to a bill in Congress it was, incredibly, voted down by people who would probably call themselves strict constructionists. I know, I know, legal scholars would scoff at my simplistic analysis, and point out that technology would be covered by the words "effects" or "papers" (which is often how constitutional protections are applied to computers, although I personally keep no paper inside my computer, strictly speaking). I'm just pointing out that there is some serious room for disagreement over these ideas. Which is what I want to talk about: disagreement. You see, Ruth Bader Ginsburg and Antonin Scalia have disagreed over the years about these things more than any other two justices you can name. They are complete polar opposites. But guess what? They were also best buddies, as Justice Ginsburg poignantly pointed out when she found out her friend had died. You can find video of them on stage discussing their differences and friendship. In it, Scalia suggests that they should be called "The Odd Couple." He also says, referring to his colleague, "What's not to like? Except her views on the law of course." It is truly charming. So charming that an entire opera was actually written about them. I love to read Scalia. He sure has a lot to say for someone who believes that we should simply read a few words and know precisely how to interpret him. I once had a case where we were arguing perhaps my all time favorite Scalia opinion, Crawford. The judge was a bit... uh, well, I can't say this so I won't. But let's just say they had apparently not had time to read Crawford (one of the most significant cases to come down in recent memory) and announced that they were going to take "five minutes" to read it. Good Luck! It is not a short opinion. In five minutes you can barely get past his analysis of the treason trial of Sir Walter Raleigh. 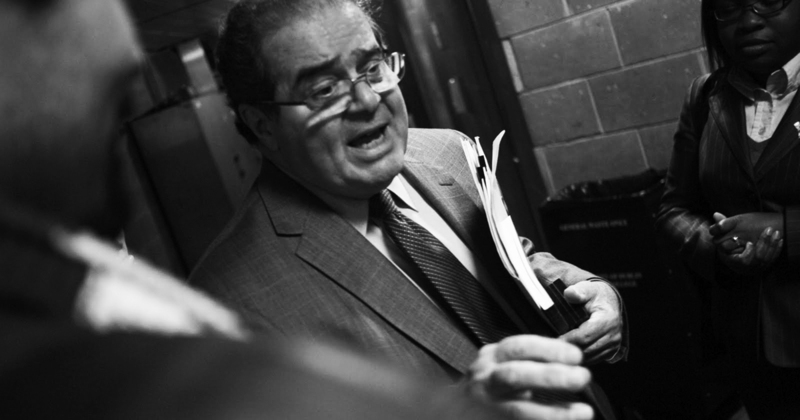 As a student of legal history, Justice Scalia had some serious chops. I have nothing but respect for his intelligence, even if I often disagreed with his positions. However, I often did agree with him. People who crow about his anti-Liberal views obviously are like that judge... a bit behind on their reading. Recently he penned Johnson, a case that has resulted in about a thousand emails in my in box from Federal Criminal Defense attorneys, which I predicted when it was issued. Johnson was extremely favorable and helpful to a certain segment of our community. Anti gay marriage folks? No. That was another opinion he wrote, a scathing dissent in Obergefell. Johnson actually protected the rights of armed criminals and has resulted in sentence reductions for some of what are arguably the most serious criminals around. Figure that one out. That Crawford case? It made it harder for the police to prove that someone was guilty of Domestic Violence, by taking a hard line approach to the Right to Confront Witnesses, the issue in Sir Walter's case. So tell me again that Scalia was a one dimensional law-and-order type. The fact is that things are not that simple. The Law is complex, whether you are an Originalist or a Living Constitutionalist, which is how it came to be that Ginsburg and Scalia developed their friendship. They may have disagreed, but they respected each other and were able to set aside their differences and have fun: riding elephants in India, drinking too much wine before dinner so that Ginsburg fell asleep at the State of the Union address (my personal favorite), and on and on. Two friends having fun. That is my point. A point that the trolls and other simpletons out there just don't get. It is what our entire system of Government is based upon. But it's also okay to find common ground, whether it is riding elephants or sneaking wine before major speeches, and it's also about mutual respect. If more people in positions of power embraced that concept we might be able to set aside our differences and come together; maybe even get some work done. Like Scalia and Ginsburg did.